Chronic hepatitis is the most common liver disease in dogs. The World Small Animal Veterinary Association Liver Standardization Group has published standards for diagnosis of the various forms of chronic hepatitis.1 This article reviews the current literature on diagnosis and treatment of canine chronic hepatitis. In most cases of canine chronic hepatitis, the cause is unknown. Known causes are outlined in Table 1.3-9 The cause, if known, should precede the term chronic hepatitis. Patients with chronic hepatitis often present with nonspecific clinical signs, although more specific signs may occur in patients with advanced disease (Table 2). Some affected dogs are asymptomatic at presentation, and clinical signs may be inapparent in patients with compensated advanced disease. 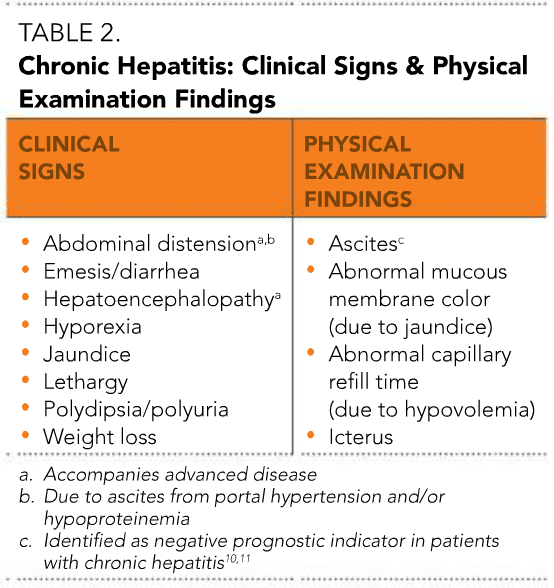 Physical examination findings for chronic hepatitis are nonspecific, often normal and, in most cases, do not provide any information to identify the affected system unless the patient has jaundice (Table 2). Laboratory investigation is required to further evaluate patients for chronic hepatitis. Clinicopathologic examination is an important component of screening for evidence of chronic hepatitis and concurrent disease, and evaluating the systemic status of the patient. A complete biochemical profile, complete blood cell count, and urinalysis are generally adequate to screen for abnormalities. Increased hepatobiliary enzyme activities, suchas alanine aminotransferase and aspartate aminotransferase, are consistent with hepatocellular damage. Variable degrees of elevated hepatobiliary enzyme activities, such as alkaline phosphatase and gamma- glutamyl transpeptidase, are consistent with cholestasis. Serum hepatobiliary enzyme activities may be normal, or only mildly increased, in patients with end-stage chronic hepatitis; therefore, even mild elevations may be significant, if persistent and when other potential causes have been excluded. Since dogs with significant liver disease can be clinically silent, in those with elevated liver enzyme activities that persist longer than 4 to 6 weeks, we recommend screening for an underlying etiology. Decreased serum albumin, cholesterol, bloodurea nitrogen (BUN), glucose (rare), or hyperbilirubinemia may reflect hepatic insufficiency or end-stage cirrhotic change. These changes must be distinguished from different or concurrent abnormalities, such as protein-losing enteropathy, decreased protein intake, polyuria (increased renal excretionof BUN), or hemolytic anemia (prehepatic hyperbilirubinemia). Liver Function. Specific tests of liver functionare often warranted, but there is no consensus on which liver function test is most appropriate. The most commonly performed test in the U.S. and, in our opinion, the most useful test (in the absence of hyperbilirubinemia), is the provocative serum total bile acids test, which includes a fasted preprandial and 2-hour postprandial (provoked) serum total bile acid concentration. Other liver function tests include fasted preprandial serum total bile acid concentration, postprandial serum total bile acid concentration, and basal plasma NH3 concentration. Blood Cells. Nonregenerative anemia due to decreased mobilization of systemic iron stores may be present in dogs with chronic hepatitis; regenerative anemia may be present if associated with gastrointestinal blood loss. Morphologic erythrocyte abnormalities due to altered lipoprotein content may also be seen. Coagulation. Coagulation status should be assessed because altered hemostasis can contribute to clinical disease and may affect diagnostic testing options. 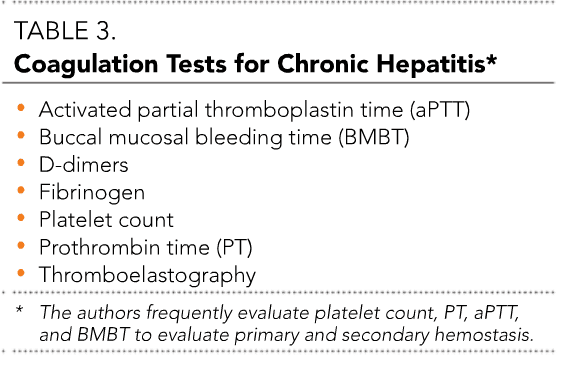 Available tests are listed in Table 3, but no individual test predicts clinically significant bleeding and, thus, evaluation of primary and secondary hemostasis is recommended. Abnormalities can result from hepatic synthetic failure, vitamin K deficiency, disseminated intravascular coagulation, and qualitative or quantitative platelet defects. Serology. Serology for leptospirosis can be submitted to determine the potential role of this pathogen. In this issue, read Canine Leptospirosis: (Still) An Emerging Infection? written by Dr. Richard Ford. that allows screening for concurrent disease and acquisition of bile. 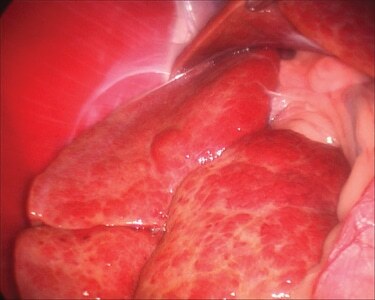 • In chronic hepatitis, the liver is variable and can be normal upon examination. • Sonographic changes consistent with chronic hepatitis include uniform increases in liver echogenicity, decreased distinction of portal vein margins, and normal to small liver size. • The liver parenchyma, biliary tree, portal vein, and peritoneum should be assessed for abnormalities, acquired shunting, and presence of free peritoneal fluid. Cholecystocentesis to acquire bile for cytologic evaluation and aerobic/anaerobic bacterial culture and sensitivity should be routinely performed in patients suspected of having chronic hepatitis. This technique can be safely performed via ultrasound guidance, laparoscopic guidance, or direct visualization during laparotomy (Figure 1). Bacterial cholecystitis can result in clinical signs and clinicopathologic anomalies indistinguishable from chronic hepatitis and, thus, exclusion of this disease is an important component of the diagnostic evaluation. Liver biopsy is essential for establishing a definitive diagnosis in dogs suspected of having chronic hepatitis. Several biopsy techniques are available for acquiring histology-grade liver tissue; however, fine-needle aspiration is NOT adequate for diagnosis of any type of inflammatory liver disease. • Pattern and distribution of characteristic components of chronic hepatitis are variable. • Disease severity is determined by amount of inflammation present and extent of hepatocellular necrosis and apoptosis. • Stage of disease is determined by the extent and pattern of fibrosis. » Copper-associated chronic hepatitis results in centrilobular (zone 3) accumulation. Percutaneous ultrasound-guided needle biopsy uses an automated, semi-automated, or manual biopsy needle to acquire hepatic tissue. 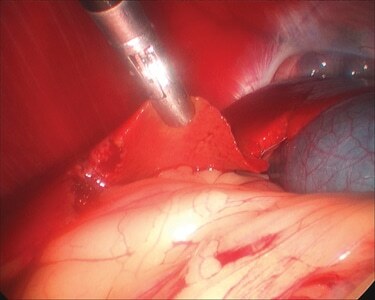 Percutaneous TruCut (carefusion.com) liver biopsies require ultrasound guidance and may be limited by a small liver or small patient size. Particular care should be taken to ensure adequate sampling (3–6 tissue specimens/samples; 14-gauge for large/medium dogs or 16-gauge for small dogs). 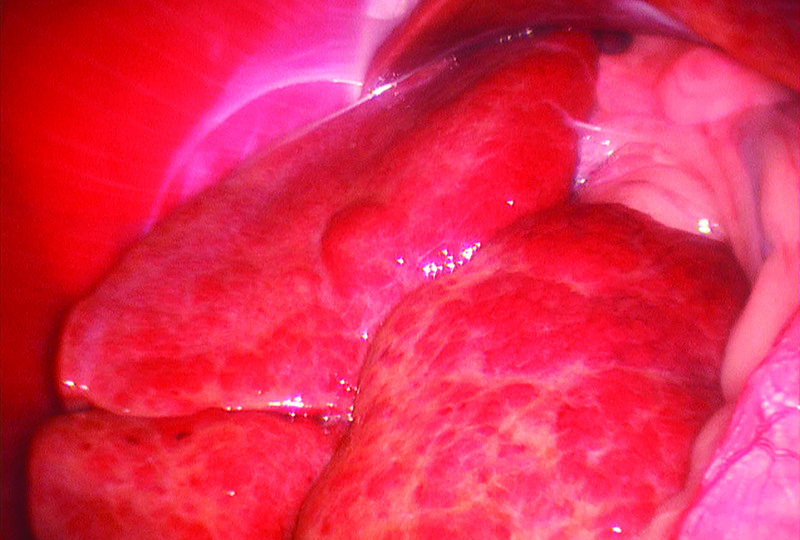 Advantages include that the technique can be performed under sedation, is minimally invasive, and isolated lesions within the hepatic parenchyma can be specifically sampled. Disadvantages include relatively smaller biopsy samples and inability to control hemorrhage directly. Sampling may be limited if the liver or the patient is of small size. Laparoscopic liver biopsy is performed under general anesthesia, and the liver is sampled with biopsy forceps. Gross examination of the liver and associated structures and targeted sampling of multiple identified lesions can be performed (Figure 2). After sample acquisition, the biopsy sites can be visually inspected for hemorrhage (Figure 3). Advantages of this technique include direct visualization of the liver; relatively large tissue samples; ability to control hemorrhage directly with a palpation probe or a hemostatic agent, such as gel foam; and access to multiple liver lobes for sampling. Disadvantages include need for specialized equipment and specific skills, general anesthesia, and cost. FIGURE 3. Laparoscopic image of liver after biopsy; demonstrates normal degree of postprocedural hemorrhage with normal coagulation. Wedge biopsy by laparotomy can be performed by transfixation or biopsy punch. Advantages and disadvantages of this technique are similar to those for laparoscopy. Additional consideration for this technique is degree of invasiveness; however, it can be combined with other surgical procedures in the abdomen. • Routine stains include hematoxylin–eosin. » Glycogen (periodic acid–Schiff stain). Additional special stains, immunohistochemical techniques, and polymerase chain reaction techniques can be performed on formalin-fixed tissue but provide better results in unfixed frozen tissue; therefore, an additional biopsy specimen should be freshly frozen. Approximately 1 gram of fresh liver tissue in a serum blood tube is required for atomic absorption analysis; however, formalin-fixed tissue may also be submitted for copper quantification. Copper quantification and aerobic/anaerobic bacterial culture and sensitivity should be considered a routine part of the diagnostic evaluation. Hemorrhage is a risk of all liver biopsy techniques and, thus, assessment of coagulation status is required despite the relative insensitivity of the available coagulation measures for predicting clinically significant bleeding. Postprocedural indications monitoring for hemorrhage is advised, with serial assessment of packed cell volume. Patients should be kept inactive for 6 to 8 hours after biopsy collection. Coagulation testing for laboratory analysis should be performed no more than 24 hours before liver biopsy because coagulation variables can change quickly in dogs with chronic hepatitis.Sampling of the liver is contraindicated if a severe coagulopathy is present (prolonged BMBT, platelet count < 80,000, PT/partial thromboplastin time prolonged > 1.5–2× normal). In some patients, however, coagulation measurements can be corrected with vitamin K supplementation, platelet transfusion, desmopressin acetate, or administration of fresh frozen plasma. • Antifibrotic therapy to inhibit fibrosis. Available evidence suggests that humans and dogs have similar mechanisms for hepatic fibrosis in chronic hepatitis; thus, most treatment recommendations are extrapolated from the human literature.16,17 Compliance is essential for treatment success. Therefore, facilitating drug administration by limiting the number of medications to those most appropriate is prudent. Hepatic encephalopathy: Appropriate dietary, probiotic, antimicrobial, and lactulose therapy. 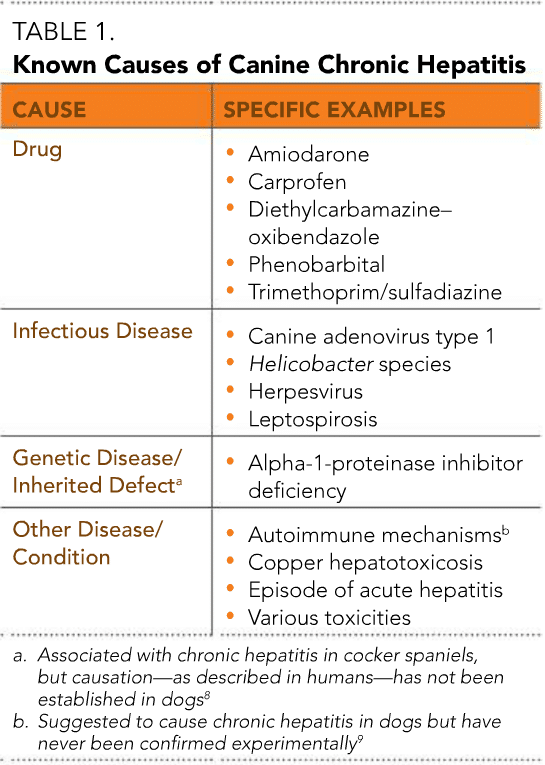 Drug-associated chronic hepatitis: Withdrawal of drug. Corticosteroid therapy with prednisone/prednisolone is the most common immunosuppressive medication used in dogs with chronic hepatitis. It has been shown to prolong survival, improve hepatic histologic changes, and induce remission.18,19 Adjunctive immunosuppressive therapy, such as leflunomide, can be added for steroid-sparing effects and/or additional immunosuppression to achieve disease remission. In our opinion, remission is best determined by repeat liver biopsy. Serial monitoring every 2 weeks for normalization or marked reduction of alanine transaminase activity can be used as a surrogate marker of disease remission and to indicate repeat liver biopsy. Glucocorticoids frequently result in variable increases in alanine transaminase, alkaline phosphatase, and gamma-glutamyl transpeptidase activity; therefore, a relative significant decrease or normalization in alanine transaminase activity is often used in lieu of a second liver biopsy. • Veterinarians should be aware, however, that limited to no evidence supports the general use of antioxidants in preventing or treating chronic hepatitis, and few studies document beneficial effects of these antioxidants in vivo. There is no standard treatment for hepatic fibrosis. Experimental studies have identified targets to inhibit fibrosis in rodents, but the efficacy of most treatments has not been investigated in dogs.17 Also, the need to perform serial liver biopsies to accurately assess changes in liver fibrosis makes studies documenting treatment efficacy difficult. However, the clinical utility of colchicine for the reversal or prevention of hepatic fibrosis is limited, and because of the associated adverse effects, which include vomiting, diarrhea, and inappetance, we do not recommend routine use of this drug. Protein restriction should be limited to the maximum tolerated level that prevents signs of hepatic encephalopathy; therefore, it may not be appropriate to start with the severe protein restriction provided by a prescription liver diet. If protein restriction is required, diets that contain moderate amounts of protein, such as prescription renal diets and geriatric diets, may be suitable alternatives to a prescription liver diet. Diets may also be supplemented with high-quality protein, such as egg whites. A consultation with a board-certified veterinary nutritionist may be necessary for patients with comorbid conditions or those in which homemade diets are indicated. Anticopper drug therapy is generally reserved for cases with documented primary or secondary excess copper accumulation. • The chelator, penicillamine, is typically used, and has additional anti-inflammatory and antifibrotic effects. • Trientine can serve as an alternative if penicillamine is not tolerated. • Copper chelators should be used for 3 to 6 months before a second liver biopsy is performed to ensure adequate disease remission and normalization of copper levels; then followed by zinc therapy, if appropriate to prevent copper reaccumulation. • Zinc toxicity can result from oral zinc administration; periodic monitoring of blood zinc concentration is recommended with use of elemental zinc therapy. Early diagnosis and intervention are important for successful treatment of dogs with chronic hepatitis because patients with end-stage disease and signs of decompensated liver function have a poorer prognosis. There is still much unknown about the etiology and treatment of chronic hepatitis in dogs. The World Small Animal Veterinary Association guidelines1 provide an important scaffolding of the etiology and treatment of this disease that should build on our current knowledge and facilitate multicenter studies, with the hope of improving patient survival and outcome. Yuri Lawrence, DVM, MA, MS, Diplomate ACVIM, is enrolled in the Texas A&M University Gastrointestinal PhD program and also serves as a senior clinician at the institution’s small animal hospital. Dr. Lawrence received his DVM from Tufts University; then completed an MA in anatomy and neurobiology at Boston University, an internship in small animal medicine and surgery at North Carolina State University, and a residency in small animal internal medicine and MS in veterinary science at Oregon State University. Jörg Steiner, MedVet, DrMedVet, PhD, AGAF, Diplomate ACVIM and ECVIM, is a professor in the Departments of Small Animal Medicine and Surgery, and Veterinary Pathobiology, as well as the director of the Gastrointestinal Laboratory, at Texas A&M University. He was recognized as a Fellow of the American Gastroenterology Association. He received his veterinary degrees from Ludwig-Maximilians University, Munich, Germany; then completed an internship at University of Pennsylvania, residency in small animal internal medicine at Purdue University, and his PhD at Texas A&M University. Routhuizen J, World Small Animal Veterinary Association, Liver Standardization Group, et al. WSAVA Standards for Clinical and Histological Diagnosis of Canine and Feline Liver Disease. Edinburgh, New York: Saunders Elsevier, 2006. Poldervaart JH, Favier RP, Penning LC, et al. Primary hepatitis in dogs: A retrospective review (2002-2006). J Vet Intern Med 2009; 23:72-80. Schulze C, Baumgartner W. Nested polymerase chain reaction and in situhybridization for diagnosis of canine herpesvirus infection in puppies. Vet Pathol 1998; 35:209-217. Chouinard L, Martineau D, Forget C, et al. Use of polymerase chain reactionand immunohistochemistry for detection of canine adenovirus type 1 in formalin-fixed, paraffin-embedded liver of dogs with chronic hepatitis or cirrhosis. J Vet Diagn Invest 1998; 10:320-325. Fox JG, Drolet R, Higgins R, et al. Helicobacter canis isolated from a dog liver with multifocal necrotizing hepatitis. J Clin Microbiol 1996; 34:2479-2482. Bunch SE. 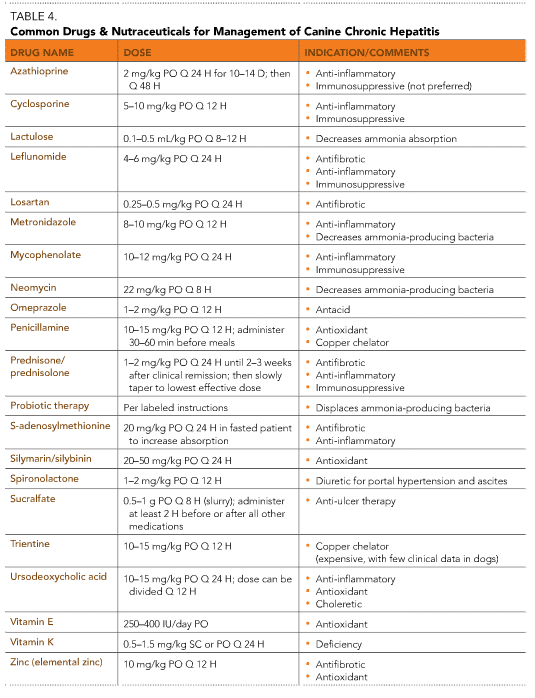 Hepatotoxicity associated with pharmacologic agents in dogs and cats. Vet Clin North Am Small Anim Pract 1993; 23:659-670. Bishop L, Strandberg JD, Adams RJ, et al. Chronic active hepatitis in dogs associated with leptospires. Am J Vet Res 1979; 40:839-844. Sevelius E, Andersson M, Jonsson L. Hepatic accumulation of alpha-1- antitrypsin in chronic liver disease in the dog. J Comp Pathol 1994; 111:401-412. Poitout F, Weiss DJ, Armstrong PJ. Cell-mediated immune responses to liver membrane protein in canine chronic hepatitis. Vet Immunol Immunopathol 1997; 57:169-178. Favier RP. Idiopathic hepatitis and cirrhosis in dogs. Vet Clin North Am Small Anim Pract 2009; 39:481-488. Raffan E, McCallum A, Scase TJ, et al. Ascites is a negative prognostic indicator in chronic hepatitis in dogs. J Vet Intern Med 2009; 23:63-66. Gomez Selgas A, Bexfield N, Scase TJ, et al. Total serum bilirubin as a negative prognostic factor in idiopathic canine chronic hepatitis. J Vet Diagn Invest 2014; 26:246-251. Center SA. 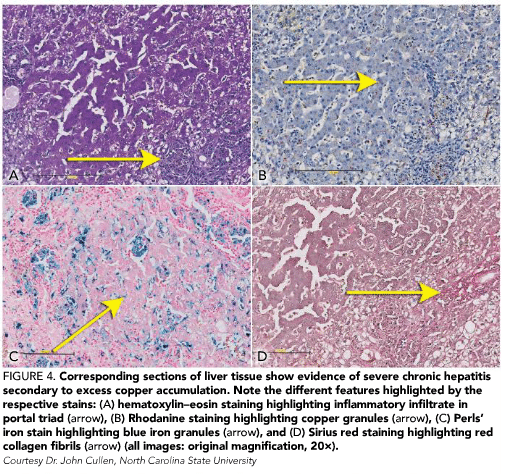 Chronic hepatitis, cirrhosis, breed-specific hepatopathies, copper storage hepatopathy, suppurative hepatitis, granulomatous hepatitis, and idiopathic hepatic fibrosis. In Guilford WG, Center SA, Strombeck D (eds): Strombeck’s Small Animal Gastroenterology, 3rd ed. Philadephia: Saunders, 1996. Levien AS, Weisse C, Donovan TA, et al. Assessment of the efficacy and potential complications of transjugular liver biopsy in canine cadavers. J Vet Intern Med 2014; 28:338-345. Kemp SD, Zimmerman KL, Panciera DL, et al. A comparison of liver sampling techniques in dogs. J Vet Intern Med 2014 [epub ahead of print]. Boisclair J, Dore M, Beauchamp G, et al. Characterization of the inflammatory infiltrate in canine chronic hepatitis. Vet Pathol 2001; 38:628-635. Bataller R, Brenner DA. Hepatic stellate cells as a target for the treatment of liver fibrosis. Semin Liver Dis 2001; 21:437-451. Strombeck DR, Miller LM, Harrold D. Effects of corticosteroid treatment on survival time in dogs with chronic hepatitis: 151 cases (1977-1985). JAVMA 1988; 193:1109-1113. Favier RP, Poldervaart JH, van den Ingh TS, et al. A retrospective study of oral prednisolone treatment in canine chronic hepatitis. Vet Q 2013; 33:113-120. Center SA. Chronic liver disease: Current concepts of disease mechanisms. J Small Anim Pract 1999; 40:106-114. Chiou YL, Chen YH, Ke T, et al. The effect of increased oxidative stress and ferritin in reducing the effectiveness of therapy in chronic hepatitis C patients. Clin Biochem 2012; 45:1389-1393. Farias MS, Budni P, Ribeiro CM, et al. Antioxidant supplementation attenuates oxidative stress in chronic hepatitis C patients. Gastroenterol Hepatol 2012; 35:386-394. Yadav D, Hertan HI, Schweitzer P, et al. Serum and liver micronutrient antioxidants and serum oxidative stress in patients with chronic hepatitis C. Am J Gastroenterol 2002; 97:2634-2639. Venturini D, Simao AN, Barbosa DS, et al. Increased oxidative stress, decreased total antioxidant capacity, and iron overload in untreated patients with chronic hepatitis C. Dig Dis Sci 2010; 55:1120-1127. Center SA, Warner KL, Erb HN. Liver glutathione concentrations in dogs and cats with naturally occurring liver disease. Am J Vet Res 2002; 63:1187-1197. Friedman SL, Roll FJ, Boyles J, et al. Hepatic lipocytes: The principal collagen-producing cells of normal rat liver. Proc Natl Acad Sci USA 1985; 82:8681-8685. Center SA. Metabolic, antioxidant, nutraceutical, probiotic, and herbal therapies relating to the management of hepatobiliary disorders. Vet Clin North Am Small Anim Pract 2004; 34:67-172. Webster CR, Cooper J. Therapeutic use of cytoprotective agents in canine and feline hepatobiliary disease. Vet Clin North Am Small Anim Pract 2009; 39(3):631-652. Watson PJ. Chronic hepatitis in dogs: A review of current understanding of the aetiology, progression, and treatment. Vet J 2004; 167:228-241. Lubel JS, Herath CB, Burrell LM, et al. Liver disease and the renin-angiotensin system: Recent discoveries and clinical implications. J Gastroenterol Hepatol 2008; 23:1327-1338. Sevelius E. Diagnosis and prognosis of chronic hepatitis and cirrhosis in dogs. J Small Anim Pract 1995; 36:521-528.